The NCAA Division I Men’s Basketball Tournament has basketball teams all throughout the United States tearing up the court to get a spot. The annual single-elimination tournament has become known as March Madness. The infamous “Selection Sunday,” where the NCAA announces the 68 teams, will fall on March 11 this year. The tournament was created in 1939 by Ohio State University coach, Harold Olsen, and the National Association of Basketball Coaches. In 2018, it includes 32 “automatic bids” of Division I Champions to teams with the best conference record. The other 36 teams are “at large” bids, whom are chosen by the NCAA selection committee. The 68 teams are separated into four regions, East, South, Midwest, and West, with each region consisting of at least 16 teams. These teams play against each other in several rounds: the First Four, the First Round, the Second Round, the Regional Semi-finals (the Sweet 16), the Regional Finals (the Elite Eight), the National Semi-finals (the Final Four) and finally, the National Championship. The First Four, the “play-in games” are when teams play against each other to get into the brackets. It still counts for a tournament win, but it is the determiner to get into the field of 64. The Final Four consists of one team from each region and they compete for the national championship. Every year, Americans fill out a bracket to try to predict which team will win the tournament.The official NCAA Division I bracket is available on the NCAA website. The bracket is broken up into four main sections, which correspond to the four main regions of the 68 teams. The top of each bracket has the numbers 1-16, located on the upper right, lower right, upper left and lower left. This is the best team against the worst in each region. Statistics come into play when plotting the 2-15, 3-14, 4-15 seeds, including team and player averages such as points per game, wins, conference ranking and lineup efficiencies. Seeds 5-12, 6-11 and 7-10 allow for more freedom in choosing the teams. Whereas seeds 8-9 are considered “tossups” and could go either way. 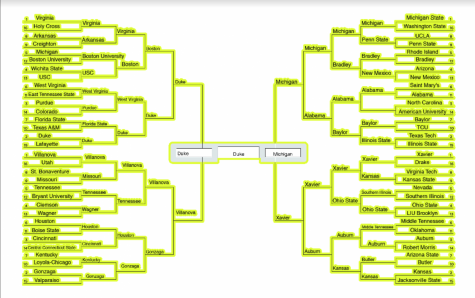 The Second Round, Regional Semifinals, Regional Finals and National Semifinals is where viewers choose which teams they predicted to win and plot them into their appropriate seeds, completing their brackets.. In the running for Selection Sunday are Duke and North Carolina. Duke’s power forward, Marvin Bagley III, has been sitting out the last four of games due to a knee injury that he sustained from a Feb. 8 game against North Carolina. Bagley has been averaging 21.1 points and 11.4 rebounds per game and is rumored to be a top-five pick for the NBA’s June draft. The 2017 NCAA Division I Men’s Basketball Tournament Champions were North Carolina Tar Heels. However, University of California Los Angeles (UCLA) holds 11 national titles, which is currently the most championships than any other team. University of Kentucky comes in second places with eight national titles. March Madness games will be broadcasted by CBS, TBS, TNT and truTV. This was printed on February 27, 2018.